Midi recording in Music Jotter is very unique, and relies on a semi realtime midi recording session instead of pure realtime recording. 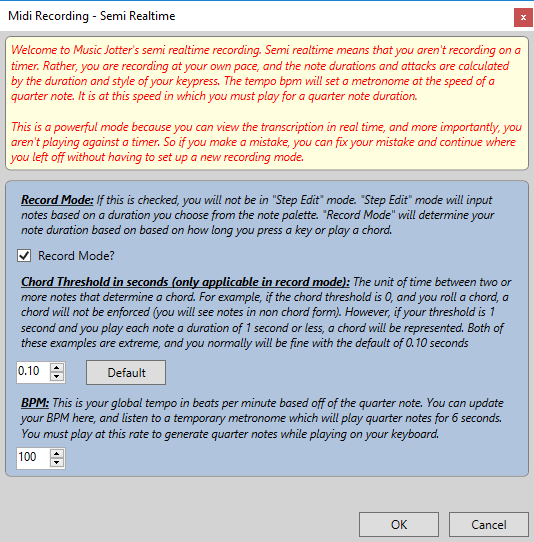 Semi realtime recording does not require a user to hit a record button, play a piece, and click stop for midi transcription. Instead, you can record midi from a midi keyboard or typing keyboard without having to worry about an actual recording session. Simply place the dynamic note cursor where you wish to start recording, and play your piece based on the global BPM. Then, watch your midi transcribe in semi realtime. You don’t have to worry about interruptions or mistakes because you can stop at any point, correct your mistake, and continue playing without any setup required! Semi realtime means that you aren’t recording on a timer. Rather, you are recording at your own pace, and the note durations and attacks are calculated by the duration and style of your keypress. The tempo bpm will set a metronome at the speed of a quarter note. It is at this speed in which you must play for a quarter note duration. Music Jotter will automatically calculate durations and ties for whole notes, half notes, quarter notes, eighth notes, sixteenth notes, 32, 64 and 128 notes. It can also calculate tuples (but only if you have selected the appropriate tuple on the edit tab). Music Jotter will not calculate dotted notes and it cannot automatically mix and match normal notes with tuples. The reason for this is so that note duration accuracy is increased. But attack values are calculated which means the lengths of your keypress are quite accurate. The chord threshold is a little tricky at first, but once you start experimenting with it, you will clearly understand what it is and why it is an option. This is best explained with an example. Let’s say you play a chord. Most likely, you don’t press all notes exactly at the same time. You may press the root note too early, the middle notes may be a little uneven, and the final note may be played a little offset of the original root note. The sound of the chord may sound slightly rolled, or arpeggiated. The threshold in seconds indicates the time between each note press while all notes are still being pressed (indicating a chord). If this number is set to 1 second, chords will be calculated very easily, but you will not have any leeway to slur your notes since everything within a second will be calculated as a chord. If this number is set to 0 seconds, you have to press all notes exactly at the same time to generate a chord, and this is very difficult. The default threshold is set to 0.10 seconds and this is generally OK, but we give you the flexibility to adjust this for your own playing style. This is your global tempo in beats per minute based off of the quarter note. You can update your BPM here, and listen to a temporary metronome which will play quarter notes for 6 seconds. You must play at this rate to generate quarter notes while playing on your keyboard.